The market moves through particular cycles. It’s a system rigged to take your money. That’s how it works. That’s why it’s there. [I]How you trade actually helps determine the very cycles that are causing you to lose[/I]. If you happened to be on the right side of the market, know that most are not…and next time you may not be so lucky. Indicators pick up on symptoms of a trade setup, but not the cause of the price movement. Jesse Livermore discovered how the markets are manipulated, and developed methods to profit from these manipulations. Richard Wyckoff codified Livermore’s discoveries and methods and applied them to chart reading. Tom Williams added VSA to Wyckoff’s work to reveal the specific tactics used to manipulate crowd behavior and expose the footprints of the Smart Money manipulators. You won’t get much out if it if you just read a few pages. My method becomes more refined as my understanding of the market increased. The thread is 3 years old as I write this update. 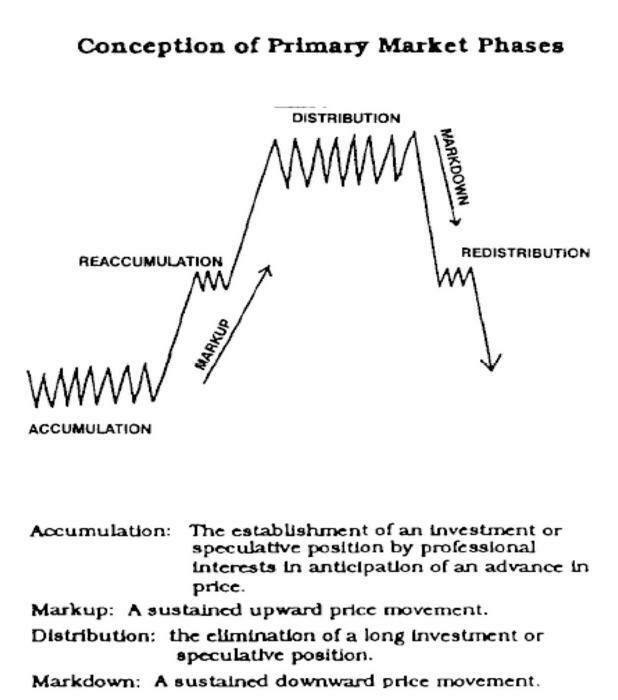 During a distribution phase, smart money has built up short positions, but the “herd” is positioned long. A markdown phase (aka down trend) runs through their stop losses. As the markdown continues, eventually it attracts much of the herd to now sell. Smart money is taking the other side of that trade. They’re already in profit on the short, but thin out their position and they take the other side of your shorts. Once they are switched over to a position biased long and gone through accumulation, they begin the mark up phase, again catching stop losses. When the herd is most aggressively selling, it is in turn when smart money is most aggressively buying. This causes the high Volume, large candles, pins, dojis we are so used to seeing (absorbtion volume). It’s systematic carnage. Sorry for the cheesy thread title. When I first started it, I figured I need something eye catching to not be overlooked. PS, I am fully aware that we are not talking about actual Volume traded, but Volume of ticks…and I prefer it that way. No debates please…we are waaaaaay past that. I can’t fully understand how to use VSA on forex, so i may suggest that this thread can be very very interesting. OK, I will start with the basics. I use the “volumes” indicator that comes with mt4. The bars that appear tell you the amount of ACTIVITY per candle (if you are using candles for price, which I mainly do). So, on a 1 min chart, each volume bar tells you the amount of activity that occured during the coresponding 1 min price candle. So, we now know the amount of activity per 1 min candle, higher volume bar means more activity. The next thing to determine is IF it’s buying or selling activity. The most basic way to determine that is to ask “what did the price do”. If you see price moving up during that 1 min candle, we can say there is more “buying” activity. BUT, buying AND selling activity will occur on a candle as well. How do we know which one has the increased volume?? to put it another way, the price candle may be green BUT, what if it has a big wick on top…indicating selling as well? [B]The answer lies in the candle close. [/B] A large wick on top, with increased volume shows us selling pressure. But needs to be taken in context with things such as s/r, and background buy and sell pressure. Very high volume spikes can mean buying and selling in large amounts. That usually happens when for example, buyers made a final push up to resistance, where they found sellers entering, all during that one candle. So, that could cause a volume spike…lots of buyers AND sellers during that candle. Btw, it was nice to trade with you last night! Hope I’ll read you here in the forum pretty soon! ok, some more about what I do. I mainly trade ej, gu and eu. I look at all TFs to get the big picture. If I can get a scalp trade in the direction of the larger TF move, I will sometimes let a piece of the trade run for more pips. I include volume in my trading. I also use common stuff, like SR, Fibbs. Which I draw myself. Also, patterns and channels. ok, some more about what I do. I will answer some common questions that I get. I mainly scalp GJ, aka “the beast”, because it gives more pips…it’s one of the most active pairs. I also trade ej, gu and eu. I like to stay on one pair though, to focus all my attention. Method: As I said in a previous post, I include volume or “VSA” in my trading. I also use common stuff, like SR, Fibbs. Which I’d rather draw myself, but I have some simple indicators for that too. Also, patterns are very important…you can find most patterns here on babypis in the school section. I suggest memorizing them. Entry signal: Wouldn’t you like to know, lol. (just kidding). I dont trade blindly off indicators. That is garbage. You are smarter than your indicators by far. And big traders dont use the HV237 trend analyzer 3000, so why should you?? The indicators are for refence and secondary to SR, fibbs, and vsa…the only things you really need to trade. The rest is bells and whistles. The idea is to KNOW what the market is doing and why, not just to be told when to buy and sell (unless you have the banks ea on your pc, lol). With a basic understanding of those 3 things, the market will either make sense, and you will trade, or be undecided and you will not trade. It is that simple for me. You will hate me for that but… about a video? I’ve been very interested in VSA, and it seems like people either swear by it, or think it’s useless based on the fact that currencies are over the counter, and the indicators really just count ticks. I guess ticks are price action, and price action can reflect volume. In any case, I’ve seen screen shots of MT4 charts at the same moment on the same pair, from different brokers that show very different volumes. Lots of things confuse me about VSA. It seems that everyone has a different term for different bars and patterns. When I first started reading on the subject, I was looking at a table of patterns. Several of the patterns said “This pattern could represent a top, a bottom, or a continuation.” I thought, " This isn’t very helpful… [B]any[/B] point on a chart is a top, bottom, or continuation." My gut tells me that VSA could be a valid tool, but when it comes to applying VSA in currency markets, the available info isn’t easy to digest and apply. Hopefully you will be able to really come down to my level, and help me wrap my head around the methodology. One thing you will very often see, to signal a reversal back down, is this. The 5 or 15 min price candle hit the level and pulled back forming a candle with a [B]large wick[/B] on top. If volume level for that candle is high compared to the recent range…it’s a give away. Sell orders were hit during that 5 or 15 mins, which caused the spike in volume. BUYERS push up price to hit target, found sellers, may have even closed longs and went short…all creating the increase in activity. Try to spot this by scrolling through your 5 and 15 min chart. A move up to a .50 - 61.8 fibb, or resistance level. A 5 or 15min candle with at least 40% wick on top, and a [B]volume spike[/B]. A reversal down begins, good entry for a sell trade. *same works in opposite direction, with a wick on the bottom of the candle. At what time do you trade? Do you use H4 chart to determine S/R and Fibs? The asian session goes from 23.00 to 6.00 GMT, or am I wrong? Thx for your help! I trade London open through min US. Good start to the week, +150 pips. I trade 7pm to 7am east…so Aisa through mid London. Good start to the week, +150 pips. question: how do I remove “newbie” from my title…I haven’t been trading 5 years to be called a noob! How insulting…hahaha. Thank you! I�ll try to join your chat if you don�t mind. Where can I find the chat? Do you have special days when you are online or it�s from monday to friday? I’m expecting a test of the red line for Aisa, but once PA wakes up I’ll be watching smaller TFs for conformation and entry. There’s a head and shoulders pattern forming there…great stuff! BTW, can you teach me how to trade using your system? Thanks! I made over 1,000 pips in April with a ridiculous % increase on my account. All my trades were annouced when I entered and exited. I’ve been here long enough to (I think) be able to tell apart the real deal from the clowns. You seem to know what you’re doing so I say: welcome to Babypips Pete. I will follow your thread and I might ask some questions along the way. Your use of volume is interesting, I’ll look closer at that. Thanks for not branding me a clown, lol I may be a good trader, but I’m a clown too, haha. But really, I have been trading quite a while, and have many friends in the fx “commuinty” that can vouch for my skills. So, yes feel free to ask questions about volume or whatever.